Today is the three year anniversary Hoboken saw a full frontal assault on the core values of the First Amendment. Similarly, it's the three year anniversary of a well-funded, prodigious political operation run on the court. On this day three years ago, Hoboken speech became the target of a vile and nefarious, perjury riddled SLAPP-suit against Hoboken residents. The intended target was not only their speech; it aimed to clobber the First Amendment rights of everyone in the Mile Square and by extension, all of NJ. This is not political rhetoric or hyperbole; this is evidenced in the documented findings of fact by the Honorable Judge Patrick J. Arre's weighty 36 page legal decision. 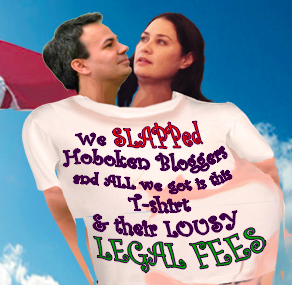 The judge's order instructs CBS radio's Lane Bajardi and Kimberly Cardinal Bajardi to pay over $276,000 in legal fees for their court designated SLAPP-suit, a massive, open-ended undertaking of frivolous litigation launched in 2012 against a dozen Hoboken residents. It also ordered the SLAPPer's three out-of-state attorneys to pay $4,000 in sanctions. Some legal observers call the ruling a triumph for the First Amendment in NJ and a warning to out-of-state carpetbagger lawyers to think before bringing similar frivolous lawsuits aimed squarely at the political speech of NJ residents. The defense counsel who withstood over two and a half years of "checkbook litigation," and quite literally dozens of legal motions by the Beth Mason supported SLAPPers call it a start. and his Beth Mason co-political operative wife Kimberly Cardinal Bajardi. The path was long and at times uncertain before Hudson Superior Court's determinative legal decision last February and most strikingly, earlier this month. It didn't come easy. One doesn't regain three years of your life after such a sustained, vicious attack on most every aspect of your life. It however, took a toll on defendants. From having to endure commenters' celebratory lies online past and present, to the unnamed defendants intimidated into anonymous silence from mention of Old Guard corruption and their underwriter of political operations: Beth Mason and the Mason family with their numerous blood-thirsty political operative henchmen. Most Hoboken residents targeted never saw a single allegation made against them. They were SLAPPed with the expectation they'd be silenced and spend tens of thousands of dollars to defend against.... nothing. Their crime was being deemed "conspirators" and "enemies" of Beth Mason by her minions who through emails obtained in discovery evidenced their political operative subterfuge collecting and obtaining personal identities. This merely one of many perjuries made to the court by the plaintiffs and their co-conspirators. On any examination, the First Amendment assault was clear but no one other than Grafix Avenger and MSV publicly pointed out the obvious. This was a SLAPP-suit "intended to censor, intimidate, and silence critics by burdening them with the cost of a legal defense until they abandon their criticism or opposition." Bad enough the media and mostly public silence but far worse the howls for blood from co-conspirators who knew and hid the truth. One featured topic of discussion in the tens of thousands of emails defendants obtained was Beth Mason political operatives actively gathering and disseminating personal information of Hoboken residents with their employment details. Some of those victimized can thank Perry Klaussen at Hoboken411 for eagerly turning over their private information to Lane Bajardi. Perry Klaussen may actually have reason for his long rumored paranoia. People may actually be looking for him. Some of those people used to be called defendants. Beth Mason, the Hoboken councilwoman who was prominently featured supporting the SLAPP-suit in 2012 remains sight unseen blowing off three consecutive Hoboken City Council meetings since Hudson Superior Court issued its massive SLAPP-suit ruling on frivolous litigation. There's been no press release, quote issued to any media on the SLAPP-suit, only a non-denial denial from an anonymous spokesman in one NJ.com story. Talking Ed Note: Through the actions of kind-hearted people who actually believe in decent governance and the First Amendment in Hoboken and who on the whole never knew or met this Horse; this website labored on with its mission statement. It was through their support and inspiration MSV soldiered on. This Hoboken SLAPP anniversary feature is dedicated to the memory of my brother Dino who never stood silent in the face of any attempted intimidation and Jimmy the K who from the beginning repeatedly said through more than two and a half years and a trial, truth would prevail. Most importantly, recognition must go to Judge Patrick J. Arre and his Hudson Superior Court legal staff who could have allowed the SLAPP to end at dismissal last February without taking on the far harder burden and high bar in NJ awarding legal fees and sanctions. The court's legal decisions on this SLAPP-suit may become mandatory First Amendment reading in law schools in NJ and beyond.